Stayed here precruise. Good points were free shuttle from airport & $5 per person to cruise terminal. It was very nice and they moved us to a non-smoking room the next day. The beds were made up with very nice sheets, pillows, feather comforters, etc. The room service was excellent and the restaurant was good. The first night, we had a smoking room. Overall a very nice property. 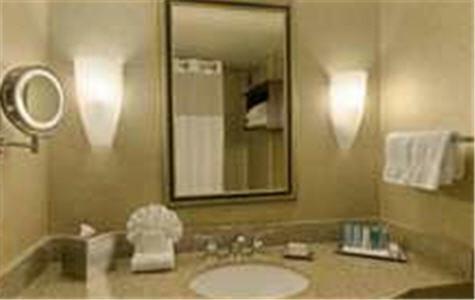 The pet-friendly Hilton Tampa Airport Westshore is located two miles from Tampa International Airport and comprises 238 luxury rooms designed for the upmarket business and pleasure traveler. The property is five miles from downtown Tampa and the Tampa Convention Center and has easy access to all the all major highways and expressway. The property is located in the Westshore business district in the fashionable West End of Tampa, There is 12,000 square feet of flexible meeting and banquet space that can accommodate 1,000 guests. Area landmarks and attractions include the Gulf of Mexico beaches, several top golf courses, the cruise ship terminal at the Port of Tampa, Busch Gardens Africa and Adventure Islands, the Florida Aquarium, Tampas Latin Quarter Ybor City, shopping at the International Plaza and Westshore Plaza Mall and the Raymond James Stadium which is the home of the Tampa Bay Buccaneers football team. The rooms and suites come with a choice of one king size bed or two double beds. The amenities include a work desk with ergonomic chair and high-speed Internet access, easy chair with ottoman, two dual-line telephones with voicemail and speakerphone, coffeemaker, 32-inch HD television with cable movie and news channels, On-Command movies and video games, iron and ironing board, easy-to-set radio-alarm clock with MP3 connectivity, curved shower rod and a hairdryer. Handicap accessible rooms are available. This hotel has an outdoor swimming pool, whirlpool, sundeck, tennis court and a fitness center. The 24-hour front desk has safe deposit boxes and information on area events and attractions. Other amenities include a cocktail lounge, business center, laundry and dry cleaning services, gift shop, newsstand, baggage storage, an ATM and ice and vending machines. The on-site Coconut's full-service restaurant is open for breakfast, lunch and dinner and room service is available around the clock. Restaurants nearby include Berns Steakhouse, an Outback Steakhouse, the Rusty Pelican, the Capital Grille, a Cheesecake Factory, the Blue Martini and the Palm Restaurant. This is a super airport hotel but despite what the song says the best things in life are not always free. Several clients were annoyed with the charges for Internet access and the high cost of eating at this full-service Tampa hotel. Despite this most business clients say they will continue to use this Hilton because the accommodation is top quality, the employees are professional and polite and dining here is top caliber even if it is expensive.